It is appreciated that not all visitors to our website, whether SAHB members or non-members, have an interest in Motor Sport but for those who do have such an interest there is currently available what could prove to be a very valuable research tool at a very reasonable price. 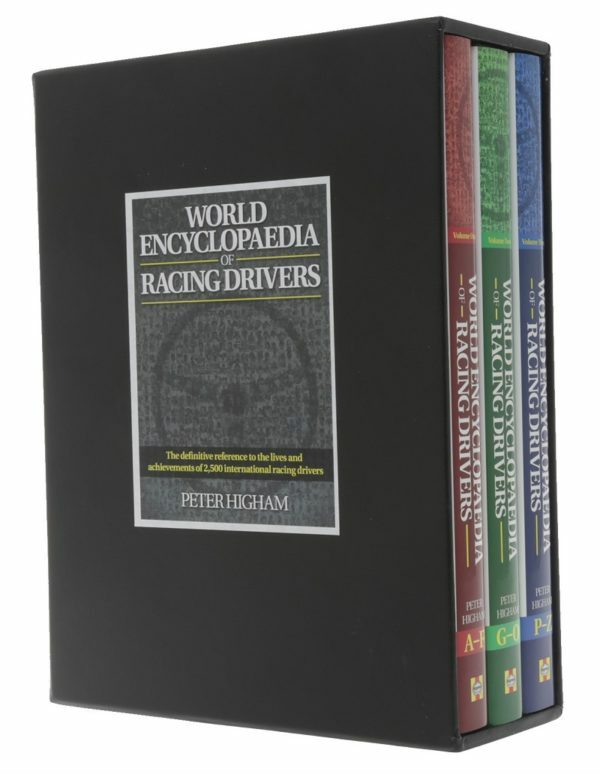 It is the “World Encyclopaedia of Racing Drivers” by Peter Higham. It was published by Haynes in 2013, ISBN 978 1 84425 433 0, and was then priced at £75. It is now, priced at £25 in the current catalogue of an outfit specialising in out of print books called PostScript (www.psbooks.co.uk). It is in three volumes in a slipcase and totals 1,084 pages. In those pages details are given of 2,500 drivers covering every driver to have featured in the Formula 1 World Championship as well as pre-war Grand Prix stars, race winners from Indycars to NASCAR, the leading lights at Indianapolis and Le Mans and national and international champions from all parts of the globe. Most entries include a photograph of the driver but all give date of birth, of death for the deceased, nationality and Principal Race Wins where such were achieved. So, pretty comprehensive with quite lengthy articles on the more significant personalities such as Jarrott, Jenatzy, Nuvolari, Segrave, Grover Williams, the winner of the first Monaco Grand Prix, Seaman, Von Brauchitsch, both Ascaris, Hawthorn, Fangio, Moss, Jim Clark, all the Brabhams, both Schumachers (the one on Michael being longer than the one on Rolf of course) and Senna through to briefer entries for some of whom, probably, only their most avid fans have ever heard. Inevitably some names which readers might consider should appear do not such as Nick Faure, UK Porsche champion and many times Le Mans driver, twice winning the Wolf Barnato Trophy, awarded annually by the BRDC for the most successful British car at that year’s Le Mans, with Steve O’Rourke, who is included. The books are produced to the usual Haynes standards, profusely illustrated and giving succinct but satisfactory information about the achievements of each driver covered. Apart from its considerable weight it should prove to be a convenient addition to a Motor Historian’s library. Price: Discounted price of £25. 1,084 pages (287mm x 220mm), 3 hardback volumes in slipcase.